The Bureau of Meteorology has issued its fortnightly ENSO wrap-up, so I've updated the sidebar. It remains on "watch" status. 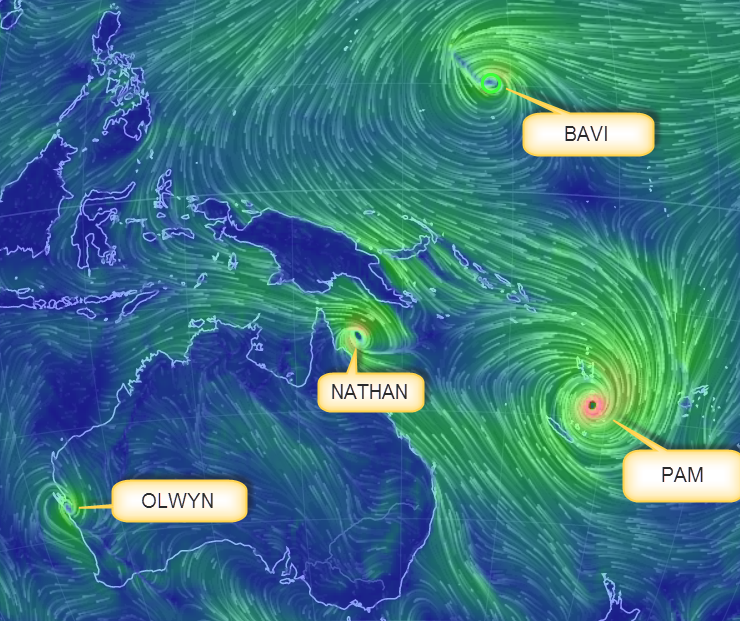 One thing it mentioned was Tropical Cyclones Pam and Bavi (Bavi was rated at TC1 by BoM). Below is an image I posted from Earth wind map, in an earlier article. (My annotations.) Bavi is above the equator and Pam below. TC Nathan is on the map above. It's still going strong. It moved east away from the Queensland coast but has done a 360 180 turn and is now heading back toward Cooktown. BoM says it's probably going to hit the coast between Cairns and Cape Melville. 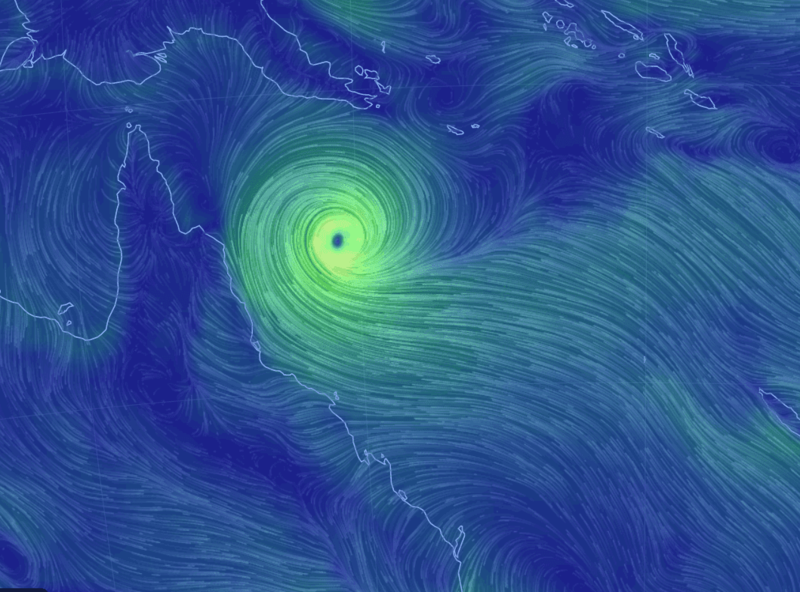 Nathan is expected to be a Cat 3 cyclone at landfall, which isn't the worst, but will be bad enough. The Bureau warning is not just about the winds and rainfall, it also mentions the likely storm surge. As Frank D said, the cyclone has intensified further. It's also swinging about a bit. Here is the track from BoM (updated with latest), together with the previous ones as above (animated). Click to enlarge. Err.. Sou, Doing a 360 degree turn means that it is still heading in the same direction! Go sit in the Ross McKitrick radian/degree conversion corner young girl! This is the second 180 turn it has done - impressive. Anon, did you just equate a mistaken driving direction at a roundabout with a McKi-trick? Anon take the 4th exit and then stand in the naughty corner for 5 minutes. The most recent update has it forecast to intensify to a Cat 4 before landfall. The most recent Technical Bulletin (at time of writing) notes: "The official forecast calls for an intensification slightly faster than the standard rate, however given the very favourable environment and small size of the system, it is possible that a period of even more rapid intensification could occur and that the system could reach category 5 intensity prior to landfall." Thanks, Frank. Not good. 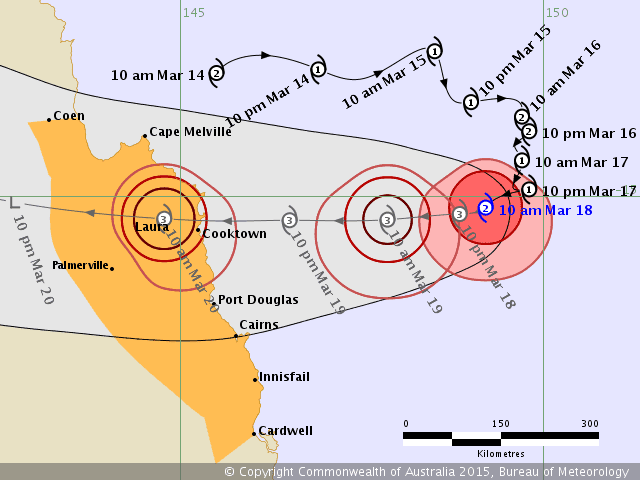 I've now added to the article an updated track for TC Nathan from BoM. The discussion around ENSO this time around is that the one indicator of El Nino strength, SOI (not SOU!) is hovering at dead-neutral, but that some other indicators are showing an alert. As BOM noted in the last wrap-up, a discrete measure such as SOI is sensitive to sporadic events such as a local cyclone. I am working on a working model for fitting SOI and it looks very good in terms of known cyclic factors. Jeff Masters at Wunderground has weighed in but I think you were first. Thanks! That 360 degree thing is a headbanger.